New official statistics revealed by the social networking giant reveal that 0.06% of the more than billion or 600,000+ logins that they have each day are compromised. This is noted by security site Sophos. 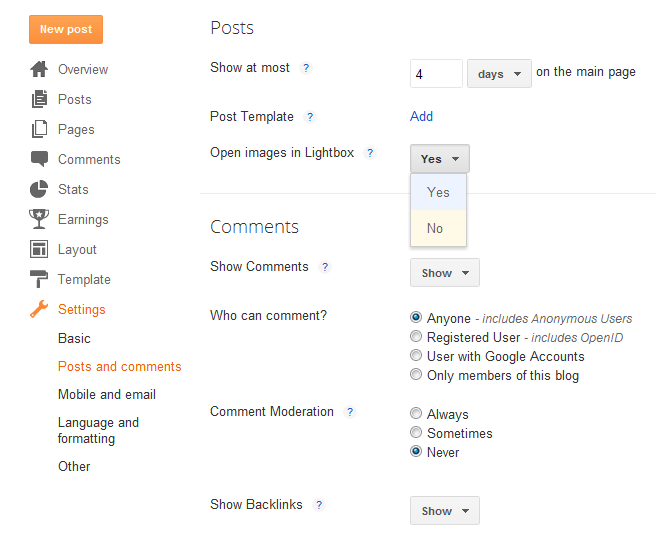 Google+ social networking site latest update push adds 4 key features. Basically knowing what is the world excited about. 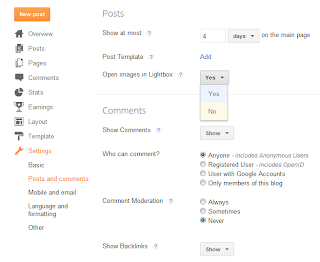 Shows how posts are shared in spider view style in a timeline period. A fast and friendly way to make powerful edits to your photos. And since Halloween is here, there is even a template just for that to add some spook to your photos. 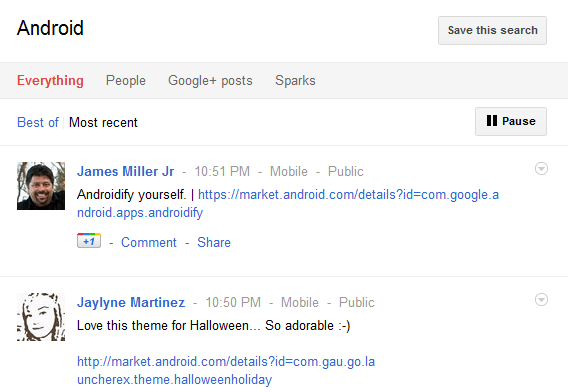 Do share them publicly on Google+ with the hashtag #gplushalloween. Google+ is now made available to all Google Apps customers worldwide. Samsung AMOLED flexible phones showing coolness - ability to bend. Separately, Nokia also demonstrated their futuristic flexible mobile device that are able to be twisted and bend. What to do if you forgot your iPhone or Android passcode? The LifeHacker published 2 tips to on what to do if you forgot your iPhone or Android passcode. The new iPhone 4S and Samsung Galaxy S2 were put to a free fall drop test to test out if how durable they are. The experiment showed Samsung Galaxy S2 significantly more durable than the obviously fragile iPhone 4S. Latest Google Chrome 15 comes with a redesign of its Chrome Web Store, several bug fixes and other new features. It is now eaiser to manage (add, update and remove) your apps using the new Chrome Web Store. Google Buzz service is going to be terminated, however, it is still possible to view and retrieve your posts. 60 Minutes has posted its two-part interview with Walter Isaacson, the authorized biographer of Apple founder and the late CEO Steve Jobs, which aired last Sunday evening. The transcript of the 2-parts interview can be found here. 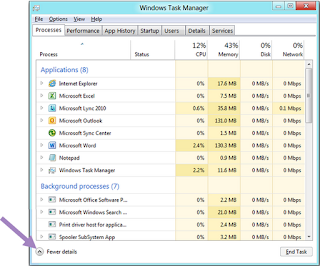 The new task manager that comes together with upcoming Microsoft Windows 8 is going to be quite different as compared to earlier versions. The new task manager comes with fewer details and with options to show more details. These new features are still slowly rolled out to all its millions of users. To see the new features before they are rolled out to you, click on the gear icon in your document list, and select Document settings. Then, from the Editing tab, check the box to "Create new presentations using the latest version of the presentation editor". Right now, a search on Google search engine has started redirecting logged in users to the secured SSL (https://www.google.com/) page, without having to use their encrypted search service (https://encrypted.google.com/). The implications of this switch to encrypted search are many and SearchEngineLand has an article on the fury from SEOs. Read this article on the reactions from SEOs that come out loud, fast & often angry to Google’s switch to encrypted search. A comprehensive article with details on how Libyan strongman Moammar Gadhafi was killed and also the life of the dictator. Google's new "Good to Know" website is a resource for everyone to learn more about online security. Longtime Libyan dictator Colonel Gadhafi has been killed and many were seen in jubilation, celebrating and dancing on the streets. You may also be interested in the dictator's story. Google and Samsung together launched the latest Samsung Galaxy Nexus that runs on Android 4.0 codenamed Ice Cream Sandwich (ICS), bringing the many Honeycomb features to smartphones. One way to find your public IP address is to search for either one of the keywords using Google. Twitter recently updated its API to enable the new Status ID generator - 'Snowflake'. With that, the new unique Tweet IDs are now 64bit unsigned integers, which, instead of being sequential like the old IDs, are based on time. The full ID is composed of a timestamp, a worker number, and a sequence number. For example, https://twitter.com/status/user_timeline/hongjun.json?count=5 now returns you both "id" and "id_str". We should now be using "id_str" instead. The following code in complete will display tweets using JSON method. Should we be using MsSQL user defined data types (UDDT)? One advantage of using is that the same type can be standardized across similar fields across several tables. For example, we can have a UDDT defined for Email. However, the headache arrives when we need to alter the data type of the UDDT. There is no alter type yet to do the job. What are the options to solving this problem? Do we really have to drop all objects (tables, stored procedures, etc) that use the UDDT, re-create the UDDT with the new type, and then re-create all tables, stored procedures, etc? That sounds quite a lot of work to do isn't it? What if we have existing records in tables and dropping tables sound way too risky. Interesting article on Site Architecture for SEO. The "Occupy Raffles Place" a call for public protest, which seeked to replicate the "Occupy Wall Street" movement in Singapore on Oct 15 supposedly, was a no-show. This is the group that talked really loud, showing fury and managed to gathered 70+ potential protesters, at the same time slamming those who were not in support of such actions. And now, a no-show from them have blamed anything, everything, all things except themselves, apologising for inconveniences. Hmm... In my opinion, one should never apologise for inconveniences if he/she wants to demonstrate. just because we didn’t talk to the media doesn’t mean we weren’t there. We are obviously very disappointed with the lack of ground support, We take the blame for lack of logistics and planning, and we apologise for any inconvenience caused. Really want to Rolling On The Floor Laughing Out Loudest. 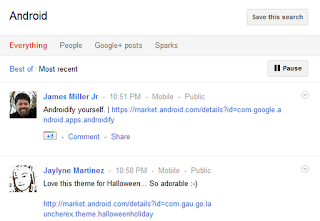 Google+ search feature will now update its search result real time and supports hashtags. For instance, a search on the keyword Android will simply return you search results and update it real time. If "Most Recent" is selected, there will be an option to Pause the real time update and Play it back again. Another feature introduced is the support of hashtags. I just made a post with #android as part of my post. Clicking on the hashtag will perform a search on it. Tapping onto MapsGL technology, Google Maps now brings a much smoother 3D experience and let you swoop into street view without the need to install plugin. All you need is a modern browser that supports WebGL e.g. Chrome 14+ and Firefox 8+. Visit Google Maps at http://maps.google.com and then click on "Want to try something new". After you have enabled WebGL, zoom in to a location to switch to street view in 3D view. Google Translate for Android now includes conversation mode feature, supporting more than 14 languages. Using conversation mode, you can now choose a pair of languages, speak into the mobile device and get them translated between the 2 languages. This new feature is certainly going to be extremely helpful when you are trying to communicate with someone from a different country speaking their own language. Download Google Translate for Android here. Just last month, Blogger announced a lightbox (slideshow) effect for images without consulting bloggers, eventually causing an uproar. The uproar prompted Blogger to remove this feature almost immediately. Now, this lightbox feature is back and enabled by default. However, it is now possible to disable it from Settings. I have disabled it. Have you? Microsoft Corp has officially completed its acquisition of Internet communications company Skype for $8.5 billion. By bringing together the best of Microsoft and the best of Skype, we are committed to empowering consumers and businesses around the globe to connect in new ways. Together, we will be able to accelerate Skype's goal to reach 1 billion users daily. 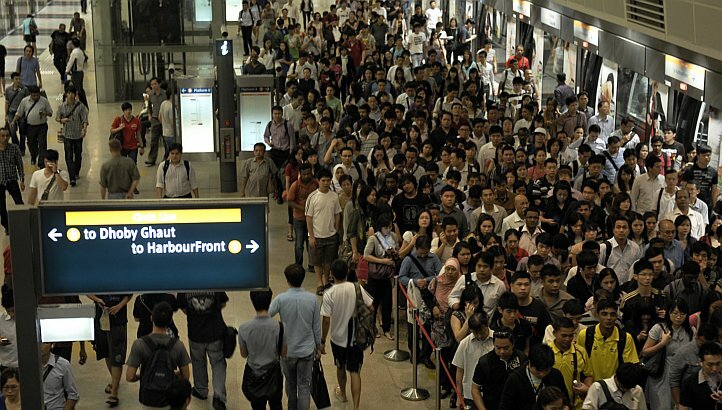 This is how crowded a train station platform in Singapore can get. Thousands were stranded on a Friday evening during peak hour after a train broke down. The cause was an SMRT train which had broken down on the East-West Line, resulting in a 20-minute delay that affected some 6,500 commuters in total. A hind train had to come in to "rescue" the faulty train, pushing it away. Though the delay was mentioned to be just 20 minutes, the backlog of passengers were so great that many were unable to board, including myself from Tiong Bahru towards Joo Koon direction at around 1830hr. To make matter worse, the entire train timings seemed to have messed up. Even at 2200hr, trains towards Joo Koon direction at Clementi station arrived at more than 7 minutes interval but trains at the reverse direction were regular at 2 minutes interval. 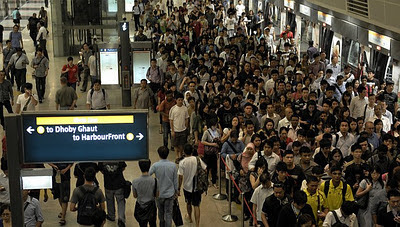 Needless to say, many poor commuters were unable to board trains towards Joo Koon. Poor quality service all at a recent 1% increase in transport fare days ago. Unacceptable! Opera Mini Browser is a fast mobile browser that can save you money on data by compressing webpages using Opera's servers before serving to clients. According to Opera, it can result in as much as 90% data savings as compared to normal browsers. The service lets you import your favorites from other services, add or remove items from your library, and feature in a visually compelling way the things you love for the benefit of others. Rather than catching dust, the likes you “shelve” on CircleMe help you connect with like-minded people, track related news and trade curated recommendations and future plans with your social circles. It’s all about the cool and interesting things you like and the people who share your tastes. Give it a try and start enjoying your true interests! CircleMe is still in private beta but if you are interested, Mashable readers can sign up to get early access to the service. A complete feature guide to Apple’s iOS 5 software update for iPhone, iPod touch, and iPad. Siri, the intelligent personal assistant for latest release of iPhone 4S, is actually been around for the past eight years. Siri was only recently been acquired by Apple in Mar 2010 for an undisclosed sum. 2003: DARPA awards SRI with a five-year contract to create an “enduring personalized cognitive assistant.” It would go on to invest $150 million in the project. Jan. 2008: Siri, one of the consumer-branded products inspired by the CALO project, spun out of SRI as its own company. Oct. 13, 2008: Siri announces it has raised $8.5 million in Series A funding in a round led by Menlo Ventures and Morgenthaler Ventures. Nov. 24, 2009: Siri announces it has raised $15.5 million in Series B funding in a round led by Menlo Ventures and Morgenthaler Ventures. Feb. 4, 2010: Siri launches an app for iPhone. The app lets you to talk to your phone and have it find and make plans for you. The app improves with repeated usage and better understands your requests over time. March 28, 2010: Apple acquires Siri for an undisclosed sum just two months after its public release. Some members of the Siri team move to Apple. Oct. 4, 2011: Apple announces Siri, a virtual personal assistant for the iPhone 4S. Microsoft Hotmail characterizes an email as "graymail" when the same message that one person thinks is “spam” could be really important to another person. It’s not black and white, hence the name. Despite the drastic decrease of true spam in the inbox, we found that most customers are still seeing newsletters, product offers, and other clutter. In fact, 75% of email identified as spam by our customers actually turns out to be unwanted graymail that they receive as a result of having signed up on a legitimate website. And because of inbox clutter, it’s easy to lose track of the really important messages in your inbox that you want to get back to. A new special category for newsletters. Using the same SmartScreen™ technology that helps Microsoft fight spam, email are categorized correctly as newsletters 95%. Every time you categorize an email manually the remaining 5% emails as a newsletter, the filtering just gets better. With Hotmail unsubscribing from a newsletter is just a click away and Hotmail will let the site know to stop mailing you, use Sweep to immediately clean up your mail and remove all the old newsletters from that sender, and finally send any new ones that come in to your junk mail until the sender takes you off their list. 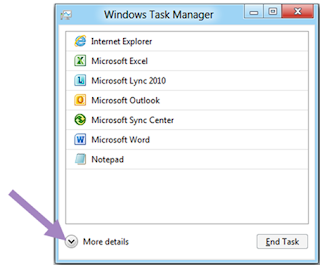 Schedule Cleanup, a new tool, unique to Hotmail, that works behind the scenes to keep your inbox organized. At Hotmail, we think the right way to track important messages is with flags, and our upcoming changes make flags even more powerful. When you feel a message is important, flag it to be it “pinned” to the top of your inbox and stays there, even as new email comes in. This means it is easy to keep track of your most important messages. What’s more, you can even set up rules to automatically flag incoming mail from certain senders, so that your most important mail is always right there at the top of your inbox. You can quickly create a new category and apply that category to all related messages at the same time – no searching for mail, no complex rules to create. You can categorize messages right in the message list with the new categories column. And categories show up as QuickViews right next to folders, so it’s easy to find what you’re looking for. In memory of Steve Jobs and in his own voice for the 1997 Think Different ad campaign commercial. 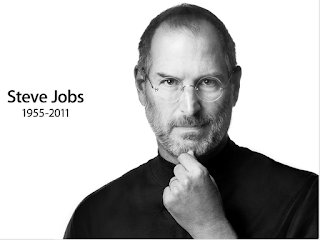 A obituary photo on Steve Jobs now appear on Apple.com. Press release from Apple announced Steve Jobs has passed away at the age of 56. Mashable published 7 best practices for improving your website's usability. However, this list is not exhaustive, and is meant merely to arm you with a few ideas that you can implement right away. YouTube founders after having bought social bookmarking site Delicious from Yahoo in April 2011, have now injected some new life into Delicious. The makeover introduces a new still delicious flavour - the concept of Stacks - collections of links that you can share - they’re playlists for the web. Select some related links, plug them into a stack and watch the magic happen. You can customize your stack by choosing images to feature, and by adding a title, description and comment for each link. Then publish the stack to share it with the world. If you come across another stack you like, follow it to easily find it again and catch any updates. New search engine upstart Blekko.com has just received a $15 million in fresh funding from Russia's largest search engine Yandex. Blekko is building a search engine free of spam, content farms and malware. Watch the below video on just how the concept of slash tags, introduced by Blekko, work. 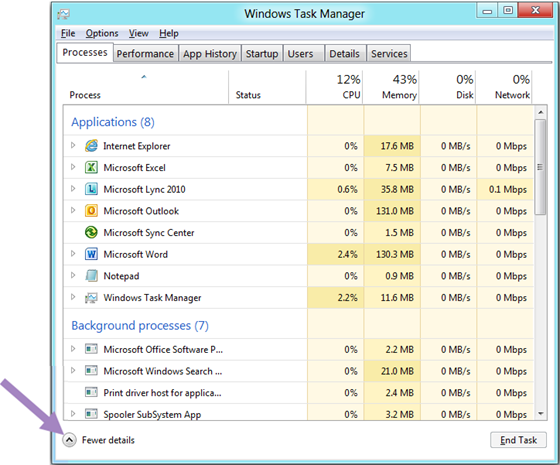 The comments shared on Twitter thus far on metro-style Windows 8 are generally positive, better than iOS and Android. However, the comments gathered thus far were more from the tech-savvy crowd. Kindle Touch have the most-advanced E Ink display technology available, and the 3G Kindle Touch adds free 3G wireless – no monthly fees and no annual contracts. They are sold at $99 and $149 respectively. The Search Engine Land wrote an interesting article that sort of provides a great introduction on event tracking using Google Analytics. GTmetrix can help you develop a faster, more efficient, and all-around improved website experience for your users. GTmetrix uses Google Page Speed and Yahoo! YSlow to grade your site's performance and provides actionable recommendations to fix these issues. Some of the recommendations from GTmetrix can be found here. Google has announced that they are using page speed in their ranking algorithm. I think it is time to optimize my blog. According to web analytics firm StatCounter, the market share of Google Chrome is set to overtake Mozilla Firefox in Dec 2011 to become second behind Microsoft Internet Explorer. The trend chart above is from the December 2008 public launch of Google Chrome browser. The rise of Chrome is at the expense of Microsoft Internet Explorer and Mozilla Firefox since the market share for the rest of the browsers like Opera, Safari, etc, are stable. According to a survey conducted by professional social networking site LinkedIn, Singaporeans are ranked second in a survey of 16 countries tallying the number of pet peeves in the office pet peeves, after the Indians. Ranking high in such a study is not to be proud of.